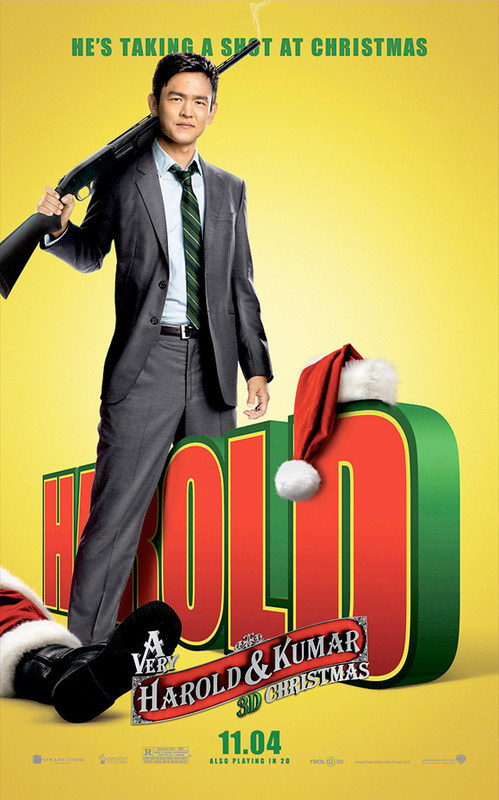 If the first trailer for the holiday comedy A Very Harold & Kumar Christmas didn't get you excited to have Kal Penn and John Cho decking the halls with Neil Patrick Harris during the most wonderful time of the year, then there might be no hope for Christmas (or at least counting on your money at the box office). However, maybe these fantastic new characters banners featuring Harold, Kumar and quite a jazzy-looking Neil Patrick Harris will get your holiday spirits up. And to top it all off, they all come together in a great final theatrical poster for a film that promises to roast more than chestnuts on an open fire. Todd Strauss-Schulson makes his feature film directing debut with this holiday comedy written by franchise creators Jon Hurwitz & Hayden Schlossberg, and starring Kal Penn and John Cho as our titular stoners. Neil Patrick Harris returns for some of the Christmas craziness that was shot in 3D, complete with some sort of claymation sequence throwing back to classic Christmas specials from decades past. Patton Oswalt, Thomas Lennon, Danny Trejo, Eddie Kaye Thomas, David Krumholtz, Elias Koteas and more also come along for the ride in this holiday comedy which hit theaters on November 4th this year. You in? saw a screening of this a while back and it's completely absurd. that baby and Waffle Bot are great. Absurd in a good or bad way ? Yeeeah he picked the two most noticable parts of the poster outside the main cast, threw them into a sentence and pretended to have seen a movie. Nothing to see here. Neil Patrick Harris is one of the most over-hyped C-List celebrities there is. Maybe I just don't get the appeal...I hope I'm not the only one.